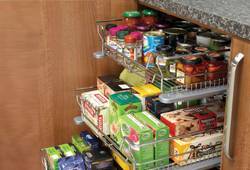 Complete your kitchen base units with these handy pull out metal storage baskets. Out of date tins and jars will be no more, now you can pull out the basket and reach those items right at the back of the cupboard with ease. We offer mega-fast free UK delivery on all kitchen baskets, and if that’s not quick enough, you can collect your order from our warehouse in York, North Yorkshire.